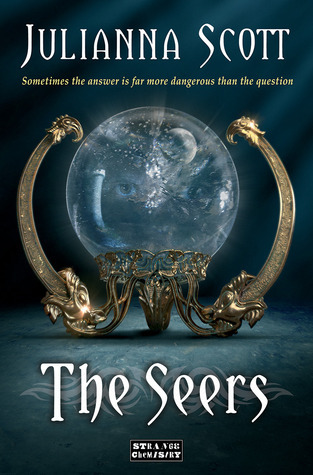 I couldn't wait to get my hands on this book, because not only is THE SEERS the anticipated follow-up to THE HOLDERS, which I gushed about here, but it was written by one of my dearest writing buddies, Julianna Scott. I actually got to meet Julianna last month while she was in town for a signing, and I can tell you that she is just as lovely in person as she is online. By the way, if you ever get the chance to meet an online writing friend in person, go for it!! It's so incredibly cool to sit face-to-face and talk about writing stuff with someone who GETS IT! Anyway, enough of my babbling, check out the blurb (not to mention the beautiful cover) from Goodreads. After nearly being drained of her ability and betrayed by a man her father trusted, Becca Ingle was left with one clue — Ciaran Shea. He holds the key to the downfall of the power-mad Holder, Darragh, and can ensure the safety of both Holder and Human kind alike... but is he willing to help? Becca, Alex, Jocelyn, and Cormac set out for Adare Manor to meet with the Bhunaidh, an aristocratic group of pure blooded Holders of whom Ciaran is a rumored member. However, when Becca discovers that they might not be the only ones after the information Ciaran has, everyone begins to wonder if Bhunaidh might not be as uninvolved with Darragh as they claim. A race to uncover Ciaran’s secrets begins, where the line between friend and foe is blurred, and everyone seems to have their own agenda. Becca will have to call on every ability at her disposal to uncover the truth, all the while knowing that sometimes the answer is more dangerous than the question. *Rubs hands together* Sounds fabulous, doesn't it? I loved it and highly recommend it! If interested, you can read my review here.